Discover, in Playa El Valle beach, the most relaxing Caribbean surrounded by a tropical landscape in Dominican Republic. Discover the amazing Playa El Valle beach, located between two mountains covered in tropical vegetation and the mouth of a river just next to them. The combination of both river and beach make it a perfect place when the sea has too strong currents, since people can bath in the river and avoid the sea. 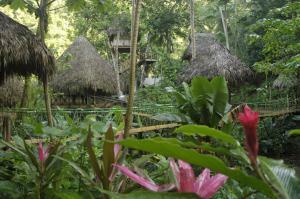 Located on the north coast of Samaná, it is well communicated by a 15 kilometer road as well as different trails. Once there, you can find a couple of local stores where to taste some typical Dominican Republic food while being surrounded by the beauty of the tropical waters and the spectacular views of green mountains in the background that will undoubtedly make your day unforgettable . On the other hand, Its fine white sand invites to both swim and walk with the water at your feet while the shade of the trees asks for some relax after the bath. 15 kilometers from Samaná, Samaná peninsula, Dominican Republic.